At Navigating ADHD, Inc, we believe that ADHD is a diagnosis that holds vast strengths and potential. Our goal with each client that we encounter is to uncover their passion, whether it is creativity, athleticism, or academic. We believe that clients can flourish if their strengths are nurtured and they develop a sense of self-awareness. The benefits of using art in coaching sessions are countless. The creative process can be tapped into easily and includes all learning styles. Art accesses the imagination, has no boundaries and elicits self expression. There is no wrong or right in the creative process freeing the creator to use art in the moment. For the ADHD brain the swirling energy can be channeled into this creative outlet. The relationship that is built between the coach and client is strengthened through the dynamic exchange art brings to the session. Often times, a child diagnosed with ADHD feels anxious before a session because they do not know what to expect or they feel as if they are “put on the spot.” Creating artwork within a session, reduces the apprehension and provides a safe, comfortable atmosphere. 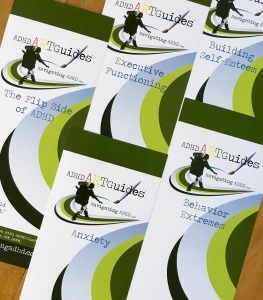 Purchase our ADHD ARTGuides™ here! Click BUY NOW to instantly download the complete ARTGuides™ eBook. OR select an ARTGuides™ chapter to purchase and we will mail it to you. ADHD ARTGuides™ provide parents, clinicians, educators and coaches step by step instructions on using art as part of an ADHD treatment plan. Projects are designed to serve as strategies for individual success. Each guide includes 10 projects, with a picture of the project, the objective, materials needed and instructions. Each guide also contains questions to ask the child or teen to help process the activity. ADHD ARTGuides™ can be purchased separately for $12.95 each or purchase an ADHD ARTGuides™ Kit which includes all five guides and art supplies for $87.95. 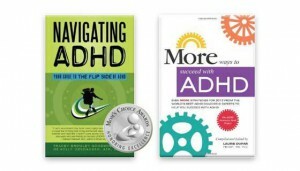 In honor of October ADHD Awareness Month, we are offering a special rate of $79.95.